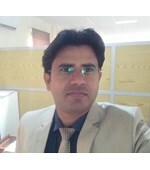 Dr. Muhammad Kamran Siddiqui is an Assistant Professor in Department of Mathematics, COMSATS University Islamabad, Sahiwal Campus, 57000, Pakistan Since August 2014. He received M Sc. degree in Mathematics and Applied Mathematics from The University of the Punjab, Pakistan. He received the M.Phil. degree and Ph.D. degree in Mathematics and Applied Mathematics from Abdus Salam School of Mathematical Sciences, Government College University Lahore, Pakistan, in 2009 and 2014, respectively. From February 2018, He is a Postdoctoral Fellow at Department of Mathematical Sciences, United Arab Emirates University, 15551, Al Ain, United Arab Emirates. His current research interests include Discrete Mathematics, Graph Theory and its applications, Chemical Graph theory, Combinatorics, Neural Networks, and Complex Dynamical Networks. Off GT Road, Sahiwal, Pakistan. 1-6-2008 31-05-2009 Lecturer ILM College, Lahore. 1-6-2007 31-05-2008 Lecturer Govt. Degree college Raiwind, Lahore. 1-6-2006 31-05-2007 Lecturer The Minhaj University Lahore . W. Gao,M. K. Siddiqui, N. A. Rehman, M. H. Muhammad,,''Topological Characterization of Dendrimer, Benzenoid and Nanocone'',Zeitschrift für Naturforschung C-A Journal of Biosciences , Vol: 74(1-2), 35-44. ,2019. Z. Chen, Z. Shao, M. K. Siddiqui, W. Nazeer, M. Najafi,,''Potential of Carbon, Silicon, Boron Nitride and Aluminum Phosphide Nanocages as Anodes of Lithium, Sodium and Potassium Ion Batteries: A DFT Study'',Russian Journal of Physical Chemistry B, Vol. 13, No. 1, 156–164,2019. P. Jeyanthi, S. Philo, M. K. Siddiqui,,''Odd Harmonious Labeling of Some Super Subdivision Graphs'',Proyecciones Journal of Mathematics, Vol. 38(1),1-11.,2019. W. Gao , M. R. Farahani , Jia-Bao Liu , M. K. Siddiqui,,''harmonic degree-based index of special chemical molecular and nanotubes, '',U.P.B. Sci. Bull., Series B, Vol. 81, Iss. 1, 1-12. ,2019. J. Zhang, Jiao Bao Liu, M. K. Siddiqui, W. Nazeer, ,,''Energy and economic aspects of co-gasification of oil sludge and plastic waste for fuel gas production'',Petroleum Science and Technology 37(4), 430-435. ,2019. M. K. Siddiqui, M. Imran, M. A.Iqbal,,''Molecular Descriptors of Discrete Dynamical System in Fractal and Cayley Tree Type Dendrimers'',Journal of Applied Mathematics and Computing, 59(1-2),1-16. ,2019. I. Tarawneh, R. Hasni, M.K. Siddiqui, M.A. Asim,,''On the edge irregularity strength of disjoint union of certain graphs'',Ars Combinatoria, Vol.142, 239-249.,2019. H. Yang , Jia-Bao Li, M. K. Siddiqui , W. Nazeer, M. Najafi,,''A Theoretical Examination of the Antioxidant Activity of NH2, OMe, and tert-Butyl Sesamol Derivatives and Their Drug Delivery with C60 Nanocage'',Russian Journal of Physical Chemistry A, 2018, Vol. 92, No. 13, pp. 2757–2760. ,2018. M. K. Siddiqui, N. A.Rehman, M. Imran,,''Topological indices of some families of nanostar dendrimers'',Journal of Mathematical Nanoscienese 8 (2), 91–103. ,2018. Y. Gao, X. Wu, A. Ahmad, M. F. Nadeem, M. K. Siddiqui, M. R. Farahani,,''Computing degree based topological indices for line graph of Titania nanotubes (TiO2)[m,n])'',Discrete Mathematics & Theoretical Computer Science, Volume 20, number 3, 23-33.,2018. Rong-Jun Bie M. K. Siddiqui, R. Razavi, M. Taherkhani, M. Najaf,,''Possibility of C38 and Si19Ge19 Nanocages in Anode of Metal Ion Batteries: Computational Examination'',Acta Chim. Slov. 65, 303-311,2018. J. Zheng, M. R. Farahani, M. K. Jamil, M. K. Siddiqui , X. Zhang,,''The Edge-Padmakar-Ivan Index of the Titania Nanotubes TiO2(m,n)'',International Journal of Pharmaceutical Sciences and Research, IJPSR, 9(3), 1274-1280,2018. M. Imran, M. K. Siddiqui, M. Naeem, M. A. Iqbal,,''On Topological Properties of Symmetric Chemical Structures'',Symmetry, 10, 173. 1-21.,2018. M. Imran, M. K. Siddiqui, A. A. E. Abunamous, D. Adi, S. H. Rafique, A.Q. Baig,,''Eccentricity Based Topological Indices of an Oxide Network'',Mathematics, 6, 126; 1-13,2018. M. Imran, M. Arfan Ali, S. Ahmad, M. K. Siddiqui, A. Q. Baig,,''Topological Characterization of the Symmetrical Structure of Bismuth Tri-Iodide'',Symmetry 10(6), 201, 1-15,2018. X. Zhang, M. Ibrahim, S.A. H. Bokhary, M. K. Siddiqui,,''Edge Irregular Reflexive Labeling for the Disjoint Union of Gear Graphs and Prism Graphs'',Mathematics, 6, 142, 1-10, ,2018. M. Naeem, M. K. Siddiqui, J. L. G. Guirao , W. Gao ,,''New and Modified Eccentric Indices of Octagonal Grid '',Applied Mathematics and Nonlinear Sciences, 1(3), 1–20,2018. S. M. Kang , M. K. Siddiqui , N. A. Rehman, M. Imran, M. H. Muhammad,,''Laplacian Spectra for Categorical Product Networks and Its Applications'',Symmetry, 10(6), 206; 1-10,2018. J. Wu, J. Yuan, M. K. Siddiqui,,''Independent set conditions for all fractional (g, f, n', m)-critical deleted NFV networks'',Journal of Intelligent & Fuzzy Systems, 35, 4495-4502,2018. M. Ibrahim, M. Asif, A. Ahmad, M. K. Siddiqui,,''Computing the total irregularity strength of wheel related graphs'',Utilitas Mathematica, 108, 321-338,2018. S. Imran, M. K. Siddiqui, M. Imran, M. Hussain, H. M. Bilal, I. Z.Cheema, A. Tabraiz, Z. Saleem,,''Computing the Metric Dimension of Gear Graphs'',Symmetry , 10(6), 209, 1-12,2018. W. Gao, H. Wu, M. K. Siddiqui, A. Q. Baig,,''Study of biological networks using graph theory'',Saudi Journal of Biological Sciences, 25,1212–1219,2018. W. Gao, M. Imran, M. K. Siddiqui, M. Naeem, F. Jamil,,''Molecular Description of Copper (I) Oxide and Copper (II) Oxide'',Quimica Nova, Vol. 41, No. 8, 874-879,2018. Z. Shao,M. K. Siddiqui, M. H. Muhammad,,''Computing Zagreb Indices and Zagreb Polynomials for Symmetrical Nanotubes'',Symmetry,10(7), 244, 1-16,2018. H. Yang, M. K. Siddiqui, M. Ibrahim, S. Ahmad, A. Ahmad,,''Computing the Irregularity Strength of Planar Graphs, '',Mathematics, 6, 150, 1-12.,2018. W. Gao, M. K. Siddiqui , M. Naeem, M. Imran,,''Computing multiple ABC index and multiple GA index of some grid graphs'',Open Physic, 16(1), 588-598.,2018. Jia-Bao Liu, M. K. Siddiqui, M. A. Zahid, M. Naeem, A. Q. Baig,,''Topological Properties of Crystallographic Structure of Molecules, '',Symmetry, 10, 265,1-20.,2018. S. Imran, M. K. Siddiqui, M. Imran, M. F. Nadeem,,''Computing Topological Indices and Polynomials for Line Graphs,'',Mathematics, 6, 137, 1-10. ,2018. M. Imran, M. K. Siddiqui, A. Ahmad, U. Ali, N. Hanif,,''On the Degree-Based Topological Indices of the Tickysim SpiNNaker Model'',Axioms, 7, 73, 1-13.,2018. S. M. Kang, M. K. Siddiqui, N. A. Rehman, M. Naeem, M.H. Muhammad,,''Topological Properties of 2-Dimensional Silicon-Carbons'',IEEE Access, 6(1), 59362-59373.,2018. X. Zhang, M. K. Siddiqui, M. Naeem, A. Q.Baig,,''Computing Eccentricity Based Topological Indices of Octagonal Grid'',Mathematics, 6, 153, 1-10.,2018. H. Yang , M. K. Siddiqui , M. Arshad, M. Naeem,,''Degree-Distance Based Topological Indices of Crystal Cubic Carbon Structure'',, Atoms, 62(4), 1-9.,2018. S. Imran, M. K. Siddiqui, M. Imran, M. Hussain,,''On Metric Dimensions of Symmetric Graphs Obtained by Rooted Product'',Mathematics, 6, 191, 1-12.,2018. M. K. Siddiqui, M. Naeem, M. Imran,,''Zero-sum flow number of some grid graphs'',Open J. Dis. Appl. Math, Vol. 1, Issue 1, 16-25.,2018. Juan L.G. Guirao, S. Ahmad, M. K. Siddiqui, M. Ibrahim,,''Edge Irregular Reflexive Labeling for Disjoint Union of Generalized Petersen Graph'',Mathematics, 6, 304,1-10.,2018. M. Naeem, M. K. Siddiqui, S. Qaisar, M. Imran, M. R. Farahani,,''Computing Topological Indices of 2-Dimensional Silicon-Carbons,'',U.P.B. Sci. Bull., Series B, Vol. 80, Iss. 4, 115-136.,2018. M. Imran, M.K. Siddiqui, R. Naeem,,''On the Metric Dimension of Generalized Petersen Multigraphs'',IEEE Access, 6(1), 74328-74338.,2018. Juan L. G. Guirao, M. K. Siddiqui, Asif Hussain,,''On Topological Properties of Block Shift and Hierarchical Hypercube Networks'',Open Physics, 16, 810-819.,2018. W. Gao, M. K. Siddiqui,,''Molecular Descriptors of Nanotube, Oxide, Silicate, and Triangulene Networks'', Journal of Chemistry, Volume 2017, Article ID 6540754, 1-10,2017. M. K. Siddiqui , D. Afzal, M. R. Faisal,,''Total edge irregularity strength of accordion graphs'',Journal of Combinatorial Optimization, Vol 34(2), 534-544,2017. W.Gao, M. R. Farahani, M. K. Jamil, M.K. Siddiqui, H. M. A. Siddiqui, M. Imran , R. Rezaee-Manesh,,''Kinetic modeling of pyrolysis of three Iranian waste oils in a micro-fluidized bed '',Petroleum Science and Technology, 35:2, 183-189,2017. N. Idrees, M. N. Naeem, F. Hussain, A.Sadiq, M. K. Siddiqui ,,''Molecular Descriptors of Benzenoid System'',Quimica Nova, 40(2), 143-145,2017. S. Imran , M. Hussain , M. K. Siddiqui , M. Numan,,''Super face d-antimagic labeling for disjoint union of toroidal fullerenes'',J of Math chemistry, 55(3): 849-863,2017. H. Wu, M. K. Siddiqui ,B. Zhao,J. Gan,W.Gao ,,''Computing the Ediz eccentric connectivity index of discrete dynamic structures'',Open Physic, 15(1): 354-359,2017. H. Jiang, M. S. Sardar, M. R. Farahani, M. K. Siddiqui, M. Rezaei,,''Computing sanskruti index of v-phenylenic nanotubes and nanotori'',International Journal of Pure and Applied Mathematics · Volume 115 No. 4, 859-865 ,2017. X. Li, M. R. Farahani, M. Rezaei, M. K. Siddiqui, Jia-Bao Liu, M. K. Jamil,,''Computing a closed formula of the Wiener index of the Polycyclic Aromatic Hydrocarbons PAHk by using the Cut Method'',J. Comput. Theor. Nanosci.Volume 14(7), pp. 3636-3640 ,2017. H. Jiang, M. K. Jamil, M. K. Siddiqui, M. R. Farahani, Z. Shao,,''Edge-Vertex Szeged Index of Titania Nanotube TiO2'',International Journal of Advanced Biotechnology and Research (IJBR), Vol-8, Issue-2, 1590-1597,2017. J.Zheng , M. R. Farahani , M. K. Jamil M. K. Siddiqui , X. Zhang,,''The Edge-Padmakar-Ivan Index of the Titania Nanotubes TiO2(m,n)'',International Journal of Pharmaceutical Sciences and Research, IJPSR, Vol. 9(3): 1000-1006,2017. M. Baca, M. K. Siddiqui,,''On total edge irregularity strength of strong product of two cycles'',Utilitas Mathematica, Vol.104, 255-275. ,2017. M.K.Siddiqui , M. Miller, J. Ryan,,''Total edge irregularity strength of octagonal grid graph,'',Utilitas Mathematica, Volume: 103 Pages: 277-287 ,2017. W. Gao, M. K. Siddiqui ,M. Naeem, N. A.Rehman,,''Topological Characterization of Carbon Graphite and Crystal Cubic Carbon Structures'',Molecules , 22(9), 1496-1507,2017. S. Gong, M. K. Siddiqui ,Y. Luo, W. Gao,,''Feasibility analysis of data transmission in SDN'',Journal of Intelligent and Fuzzy Systems 33(5):3145-3152 ·,2017. Muhammad Naeem, Muhammad Kamran Siddiqui,,''Total irregularity strength of disjoint union of isomorphic copies of generalized Petersen graph'',Discrete Mathematics, Algorithms and Applications Vol. 09, No. 06, 1750071,2017. M. Rezaiel, W.Gao, M.K.Siddiqui, M.R. Farahani,,''Computing hyper zagreb index and m-polynomials of titania nanotubes tio2[m,n]'',Sigma J Eng & Nat Science, 35(4), 707-714,2017. M. K. Siddiqui,M. Imran,A. Ahmad''On zagreb indices, zagreb polynomials of some nanostar dendrimers'',Applied Mathematics and Computation,280, 132-139,2016. A. Ahmad,M. Ibrahim,M. K. Siddiqui ''On The Total Irregularity Strength of Generalized Petersen'',Math. Reports 18(68),197-204.,2016. A. Ahmad, M. Baca, A. S. Fenovcikova, M. K. Siddiqui, ,,''Construction of a-tree from smaller graceful trees'',Utilitas Mathematica,99(1), 175-186.,2016. W. Gao, M. K. Siddiqui, M. Imran, M. K. Jamil, M. R. Farahani ,,''Forgotten topological index of chemical structure in drugs'',Saudi Pharmaceutical Journal 24, 258–264,2016. M. R. Farahani, H. M. A. Siddiqui, S. Baby, M. Imran, M.K.Siddiqui ,,''The second and second-sum-connectivity indices of TUC4C8(s) nanotubes'',Journal of Optoelectronic and Biomedical Materials".Volume 8(3)-july-september,107-111, 2016.,2016. W. Gao, M. R. Farahani, M. K. Jamil, M. K. Siddiqui,,''The Redefined First, Second and Third Zagreb Indices of Titania Nanotubes TiO2[m,n], '',The Open Biotechnology Journal, 2016, 10, 272-277.,2016. O. Al-Mushayt, A. Ahmad, M. K. Siddiqui ,,''Irregular total labelings of convex polytope graphs having the same diameter. '',Utilitas Mathematica 101 (2016), 295-307.,2016. M. K. Siddiqui,,''On irregularity strength of convex polytope graphs with certain pendent edges added'',Ars Combinatoria, vol.129. 199-210 (2016).,2016. W. Gharibi, A. Ahmad,M. K. Siddiqui,,''On Zagreb Indices, Zagreb Polynomials of Nanocone and Nanotubes'',J. Comput. Theor. Nanosci. 13, 5086–5092 (2016).,2016. M. K. Siddiqui, M. Naeem, N. A. Rahman, M. Imran,,''Computing topological indices of certain networks'',Journal of Optoelectronics and Advanced Materials Vol. 18, No. 9-10, September - October 2016,pp.884-892.,2016. Jia-Bao. Liu , W. Gao, M. K. Siddiqui , M. R. Farahani,,''Computing three topological indices for Titania Nanotubes TiO2'',AKCE International Journal of Graphs and Combinatorics 13, 255–260,2016. W. Gao, M. R. Farahani, M. K. Siddiqui, M. K.Jamil ,,''On the First and Second Zagreb and First and Second Hyper-Zagreb Indices of Carbon Nanocones CNCk[n]'',J. Comput. Theor. Nanosci. 13, 7475–7482 ,2016. M. K. Siddiqui , W. Gharibi,,''On Zagreb Indices, Zagreb Polynomials of Mesh Derived Networks'',J. Comput. Theor. Nanosci. 13, 8683–8688,2016. M. Imran , M. K. Siddiqui, M. Numan,,''Super d-antimagic labeling of uniform subdivision of wheel '',U.P.B. Scientific Bulletin Series A,77(2),227-240.,2015. A. Ahmad, M. Baca, M. K. Siddiqui,,''On total edge irregularity strength of categorical product of cycles'',Theory of Computing System,54,1-12. ,2014. A. Ahmad, M. Baca, M. K. Siddiqui,,''On irregular total labeling of disjoint union of Prisms and cycle'',Australasian J. of Combinatorics,59(1), 98-106,2014. M. Baca, M. K. Siddiqui,,''Total edge irregularity strength of generalized prism'',Applied Mathematics and Computation,235, 168-173.,2014. A. Ahmad, O. Al Mushayt, M. K. Siddiqui,,''Total edge irregularity strength of strong product of cycles and paths'', U.P.B. Scientific Bulletin Series A,76(4),147-156,2014. M. K. Siddiqui, N. Akhtar, H. R. Alrajab,,''On Z_3k magic labeling of certain families of graphs'',Science.Int, 27(1),1-5.,2014. M. Baca, M. Lascsakova, M. K. Siddiqui,,''Total edge irregularity strength of toroidal fullerene'',Mathematics in Computer Science,7(4),487-492,2013. M. Baca, M.Numan, M. K. Siddiqui,,''Super face antimagic labeling of union of anti prisms'',Mathematics in Computer Science.7(2),245-253,,2013. M. K. Siddiqui, E. T. Baskoro, Nurdin,,''Total edge irregularity strength of disjoint union of Helm graphs'',Journal of Mathematical and Fundamental Sciences,45(2), 163-171.,2013. M. K. Siddiqui, A. Ahmad, M. F. Nadeem, Y. Bashir,,''Total edge irregularity strength of the disjoint union of sun graphs'',International J. of Mathematics and Soft Computing,3(11),21-27.,2013. O.Al Mushayt, A. Arshad, M. K. Siddiqui,,''Total vertex irregularity strength of convex polytop graphs'',Acta Mathematica Universitatis Comenianae,LXXXII,29-37.,2013. M. K. Siddiqui, M. Numan, M. A. Umer,,''Face antimagic labeling of Jahangir Graph'',Mathematics in Computer Science,7(2), 237-243. ,2013. A. Ahmad,M. K. Siddiqui, D. Afzal''On the total edge irregularity strength of zigzag graphs'',Australasian J. of Combinatorics,54,141-149.,2012. O. Al Mushayt, A. Ahmad, M. K. Siddiqui''On irregular total labeling of hexagonal grid graphs'',Australasian J. of Combinatorics,54,263-271.,2012. M. K. Siddiqui,,''On edge irregularity strength of subdivision of star Sn'',International J. of Mathematics and Soft Computing,2(1),75-82,,2012. M. K. Siddiqui,,''On total edge irregularity strength of categorical product of cycle and path'',AKCE Int. J. Graphs Combinatorics,Vol. 9. No.1,43-52.,2012. A. Ahmad,M. K. Siddiqui, M. F. Nadeem, M. Imran, ''On super edge magic deficiency of kite graphs'',Ars Combinatoria,107,201-208,2012. A. Ahmad, M. Baca, Y. Bashir, M. K. Siddiqui,,''Total edge irregularity strength of strong product of two paths'',Ars Combinatoria,106,449-459,2012. M. K. Siddiqui,D. Afzal,''On Tvs of Subdivision of Star'',Australian Journal of Basic and Applied Sciences,5(11) ,2146-2156,2011. 2013 International Thailand Bangkok Cimpa-Unesco-Mesr-Mineco-Research School on Graphs, Codes and Design -Thailand, May 20-31, 2013. 2013 National Pakistan Lahore 6th World Conference on 21st Century Mathematics, 2013, held at Abdus Salam School of Mathematical Sciences, GC University Lahore, Pakistan from March 6-9, 2013. 2012 International Indonesia Bandung The 3rd Graph masters Workshop held at ITB Bandung Indonesia, July 18-19, 2012. 2012 International Indonesia Bandung The 5th International Workshop on Optimal Network Topologies, IWONT 2012, ITB Bandung, Indonesia, July 27-29, 2012. 2012 International Indonesia Puncak The 7th International Workshop On Graph Labeling 2012, held at Hotel Seruni, Puncak, Indonesia, July 23-25, 2012. 2011 National Pakistan Lahore Participation in the seminar series on “Geometric Measure Theory” delivered by Dr. Franks Morgan (Vice President of American Mathematical Society) held at Abdus Salam School of Mathematical Sciences from April, 2–8, 2011. 2011 National Pakistan Lahore 7. 5th World Conference on 21st Century Mathematics, 2011, held at Abdus Salam School of Mathematical Sciences, GC University Lahore, Pakistan from February 9-13, 2011. 2009 National Pakistan Lahore 8. “One Day Undergraduate Conference on Mathematics ” November 16, 2009, held at Abdus Salam School of Mathematical sciences, GC University Lahore, Pakistan. 2013 Abdus Salam School of Mathematical Sciences, GC University, Lahore, Pakistan Won the Best research performance award, 2013 during the PhD study at Abdus Salam School of Mathematical Sciences, GC University, Lahore, Pakistan. 2009 Higher Education Commission, Pakistan Higher Education Commission, Indigenous Scholarship M.Phil leading to Phd Since(2009-20014). Disclaimer: The information displayed on this page belong to the author. Our employees are obliged not to display any false information. Therefore, CU will not take any liability for any false information included in this page. In case of any damages or other liabilites arising, employees are fully responsible for the content of their profiles.